Pride of Ownership - Feels like a new home! Absolutely gorgeous Designers home situated on the Ironwood Golf Course side in the gated enclave of Anthem Country Club. Spacious and light filled, the great room floorplan has 12 foot ceilings and huge windows that take in the Designer backyard views! 10 Inch Crown Molding! 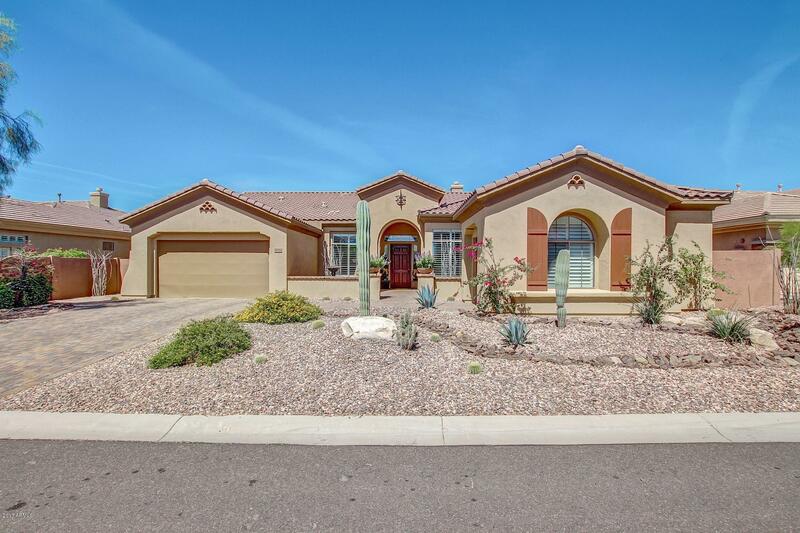 The 4 bedroom, 3.5 bath home also has a spacious den/office and an extensive covered pavered patio for outdoor entertaining. The beauty of this home is in the flexibility of the floorplan - The great room is off the entertainer's dream kitchen and lets you join the party, while separate living areas give you options for creating formal or casual spaces in the home. Dining table? Pool table? How about both! A quiet place to read or work, or a game room? In this home, you can have it all!This beautiful Sonoma floor plan is filled with upgrades: Travertine laid in the French Versailles pattern throughout entire home; upgraded sculptured carpet used in all bedrooms; granite counters in Kitchen and all bathrooms, Professional GE Monogram stainless steel appliances and 6 burner gas cooktop in kitchen; butler's pantry with granite counter and built in wine refrigerator; beautiful upgraded Maple cabinets in kitchen, butler's pantry, and all baths. Split master floorplan has a spacious master suite with French doors exiting directly to covered patio area and lets you take in the designer backyard views! The master bath has a spa-like feel and is flooded with natural light from the garden window over the jetted soaking tub. The master bath also offers a separate glass block and travertine shower with step-in entrance, double sink vanity, and separate toilet room. A spacious walk-in closet with a Classy Closet organizing system completes the luxurious master suite. The guest room wing of the home has three roomy bedrooms - two bedrooms have a Jack'n'Jill bath with double sink vanity and a separate room for the toilet and shower with a pocket door; the third guest room has a full en-suite bath and enjoys designer backyard views. A half bath and full laundry room, complete with utility sink and cabinets, is also in this area of the home. Classy Closet system in all closets. Plantation Shutter every window. This home also offers a large two car garage, with epoxy coated floors, built in storage cabinets and exit door allowing access to the side and rear yards. A separate third full sized garage bay is perfect for a golf cart or all your "toys". Both the front and rear yards have been professionally designed and landscaped using desert loving, low water and maintenance plantings. Entertainers' backyard with gas Fireplace and Travertine Island and 6 burner grill. A new artificial turf lawn, trimmed with offset pavers and a pavered walkway, was constructed of the highest grade turf for an extremely natural look and the feel of a 'real' lawn-without the need for water or maintenance! The spacious covered patio, combined with the lawn area, gives you lots of options for outdoor entertaining, or for just relaxing and taking in the SPECTACULAR designer backyard views!!! Homeowners in the guard-gated enclave of Anthem Country Club enjoy a true resort lifestyle; two beautiful Clubhouses and adjoining golf courses, Persimmon and Ironwood, offer restaurants, sports bar/lounges, swimming pools, state-of-the-art workout facilities, sauna, steam, Jacuzzis, tennis courts, Pickle ball courts, fitness classes, outdoor grill and beverage service and banquet facilities. CC homeowners are also entitled to use of the Community Center and fitness facility, basketball courts, volleyball courts, stocked fishing lake, swimming pool, waterpark and train. Your clients simply must see this fantastic home in this award winning community! HOME WARRANTY transfers to buyer! Designer backyard views, Sonoma model has 12 foot ceilings, huge windows in every room for lots of natural light and views, and the flexible floor plan lets you create the rooms you want to fit you and your family best. Located in the Club and within walking distance to the Ironwood Clubhouse, pool, workout facility, sauna, Jacuzzi, restaurant and bar. Pavered driveway and sidewalks and extensive patios.